The Automotive Passenger Car market can be divided into first-fill OEM customers and consumers more focused on after-sales lubrication and maintenance. The later can be further split into OEM Franchise work-shops, independent dealerships or DIY enthusiasts with their main criteria for grease selection being an optimised balance of fit-for-purpose quality, performance and cost effectiveness. Whilst the operating conditions themselves may not be among the most extreme, achieving a balanced combination of physical properties and performance enhancing additives to protect against the effects of mechanical movement as well as the corrosive and abrasive impacts of external contaminants such as water is still essential to ensure effective grease lubrication. The first-fill market tends to focus on fill-for-life applications such as CV Joints or the in-car lubrication of switch gear and electrically operated mechanisms such as windows, sunroofs and seats. Due to their need to deliver superior performance for the lifetime of the vehicles, the technology platforms on which they are based tend to be more specialized. 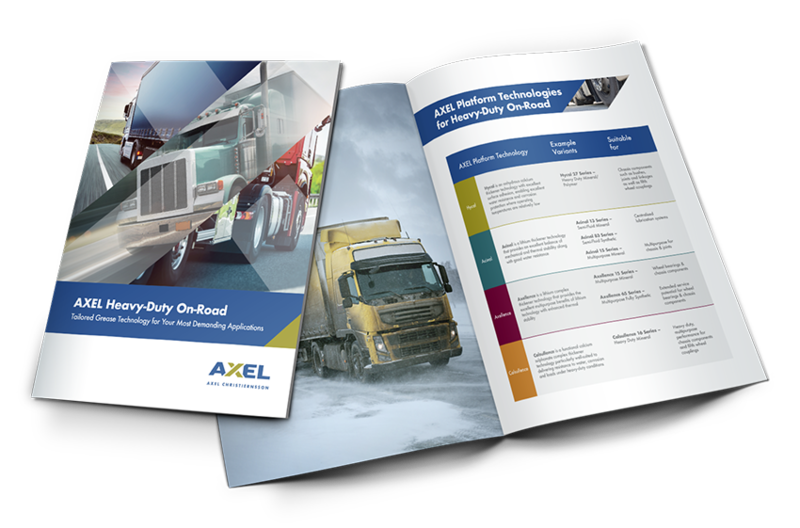 So whether you require a first-fill speciality or a premium after sales solution for the Automotive market, AXEL's broad range of grease technology platforms provides us with the potential to develop finished products capable of meeting the needs of both.